One month ago, Melissa Brown and her family moved to a farm in Grey County. 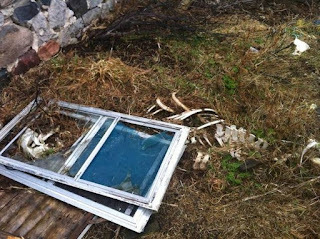 After the snow melted they started cleaning the grounds, and made a terrifying discovery. Buried on the property were the remains of 150 - 200 deceased animals. So far, Brown and her husband have found one horse skeleton, several baby goats, two dead calves, and the remains of several small animals, including rabbits, chickens, and cats. Brown states that two weeks ago she called the Ontario Society for the Prevention of Cruelty to Animals (OSPCA) twice, "...and they didn't listen. Period, didn't listen." After twice being ignored by the OSPCA Brown called the West Grey Police, who began to investigate. Only once the police took action did the OSPCA cooperate in investigating the property. The OSPCA states it has no record of any phone calls concerning the mass grave of nearly 200 dead animals. - Seized 71 dogs from a rescue. One of the dogs was killed without its owners being notified, and the remaining 70 have now spent 8 months in cages. The OSPCA has had the couple who run the rescue charged with 4 counts of animal cruelty (the charges are still pending) but says it will return the dogs if the couple pays the organization over half a million dollars. - Refused to charge an OPP officer who ran over a 14 year old blind, deaf dog three times before shooting it to death. - Gone to court with an application to kill 21 dogs seized from a dog fighting operation. - Returned a dog to its owner after witnesses saw the man repeatedly whip, punch, and kick the animal. These are only the cases the Ontario public are aware of due to eyewitness and media accounts. It is truly frightening to think of the cases we don't know about. It is time for the Ontario government to stop telling us how proud it is of animal welfare in this province. It should be beyond ashamed. The OSPCA is a disgrace to animal welfare in Ontario. 1. Stop donating to the Ontario Society for the Prevention of Cruelty to Animals. STOP DONATING NOW. Show the OSPCA you simply can not support an organization that acts as a private police force for animal welfare in this province, you can not support an organization that continues to abuse its power and lie to the public. 2. Write to Premier Kathleen Wynne at kwynne.mpp@liberal.ola.org and to the Minister of Community & Correctional Services Yasir Naqvi at ynaqvi.mpp@liberal.ola.org. They need to know that animal lovers in Ontario will no longer sit idly by while they do nothing to reign in the OSPCA. 3. USE SOCIAL MEDIA : Use the hashtag #ReformTheOSPCA to raise awareness. Tweet Ontario Premier @Kathleen_Wynne and @Yasir_Naqvi. It is clear as day the corruption and lack of transparency at the OSPCA will never change until the provincial government takes this matter as seriously as Ontarians. Let's show the government we will never stop fighting for the animals they continue to fail.